Walls lies on the south side of Shetland's West Mainland, at the head of Vaila Sound and sheltered even from southerly storms by the islands of Linga and Vaila. You reach Walls via the main road that heads west from Tingwall. This winds its way around the head of Weisdale Voe, offering stunning views to the south before eventually emerging at the Bridge of Walls where the road to Sandness heads off north west. The final few miles to Bridge of Walls are along single track roads, though like all of Shetland's roads these are of extremely high quality and very well maintained. For more information about Scotland's single track roads and how to drive them, visit our feature page on driving single track roads. On the last couple of miles into Walls you also need to watch out for Shetland ponies wandering the road the way sheep do elsewhere in Scotland. Walls itself is a quieter place than once it was. 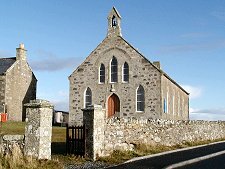 The large houses of Bayhall, now converted into flats, and Voe House are signs of past wealth, as are the three churches visible around the head of the sound. Two are still in use, while the third bears a sign showing its later conversion to a bakery. 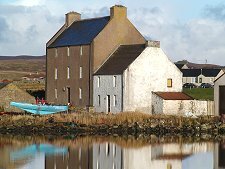 A pier was built in Walls in the 1700s, and from 1838 the village was a centre for fish curing. 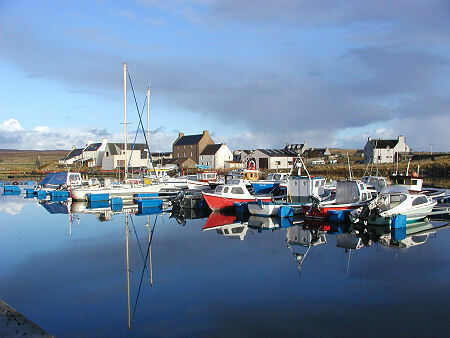 A little to the east of the centre of the village is the marina, making this a popular base for leisure sailors. The fishing vessels that are still based in Walls tend to use the pier a few hundred yards along the west side of Vaila Sound. 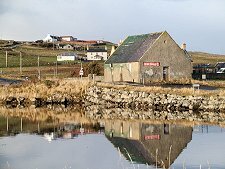 This is also the terminus for the ferry service to the island of Foula, some distance out into the Atlantic from Shetland's Mainland.